There are some extremely persuasive arguments for publishing and selling your own e-book online. The profits are potentially high - providing you can actually find a market for the book. Jim Edwards is something of a success story in this field, with endorsements from such marketing gurus as Joe Vitale, author of titles as alluring as The Greatest Money-Making Secret in History! and Spiritual Marketing: A Proven 5-Step Formula for Easily Creating Wealth from the Inside Out. A big part of Jim Edwards' success can be attributed to his marketing talent, which you can witness by clicking on one of the links to his own e-books below. That's right! He sells e-books that tell you how to write e-books! Even if you don't want to write your own e-books, you can sign up (free) as an affiliate, sell Jim's e-books on your existing website and pocket a hefty commission... Take a look. "The Lazy Man's Guide to Online Business"
Sell Your Own Customized Merchandise Online - With No Stock! CafePress is a US based outfit that offers an excellent service to those of us who have no money to spend, but plenty of creative design ideas. After signing up (FREE) you'll be able to apply your own designs to everything from T-shirts and mugs to bumper stickers and CDs of your own music! The items have a fixed base price; you just add on your cut. Promote your items on your website as well as the CafePress site and wait for the cheques to roll in... CafePress cater for international customers, so don't worry if you live outside the US! Click here to check out our own range of merchandise. Even if you want to publish hard copies of your own e-book or novel, CafePress can help! Read our articles in our advice section about entering competitions by Lynne Suzanne - they'll give you an idea of how simple and rewarding competitions can be! The articles have been written about competitions in the UK, but they examine techniques which can be applied internationally. With a little time and effort you could be on the receiving end of cars, holidays and cash! Be in it to win it! There are plenty of opportunities to win prizes online as well. Below are just some of our featured competitions, many of which are FREE to enter! You'll also find links to competition sites in our resources section. 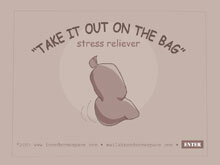 If all else fails, visit our interactive stress reliever. Get it all out of your system with our free Flash game! Click for Free, Instant Stress Reduction! If the idea of creating your own website seems a little daunting, you will find plenty of help both online and in print. It can be a very rewarding experience, and it involves relatively little outlay. See our resources section for links to some excellent sites and sources of information. The Internet is excellent at providing niche market opportunities; if you want to start up an online bookstore, you'll be up against some pretty stiff competition. However, if you want to sell comic books from the 1950's, you'll get fewer (but more relevant) visitors who are more likely to be interested in your specialist site than in just another site selling the latest best sellers. The best part is that you don't actually have to have any stock to create a website which makes you money. You don't have to worry about processing payments, shipping merchandise or dealing with problem customers. How do you manage this? Become an affiliate. Receive cash for sales created by links on your site! I could go on for hours about the potential benefits of being an affiliate; where to go, what to do - but half the fun is finding out what is possible for yourself! However, a few tried and tested pointers will put you in the right direction. There are plenty of books available on the subject, but one which I read with enthusiastic speed was The Neatest Little Guide to Making Money Online, by Jason Kelly, available as both a US Edition and a UK Edition. In short, the biggest investment you will make is your time. The cost of your domain name, webspace and time online is the main financial outlay, but it won't break the bank. You'll find links to web service providers in our resources section, as well as links to affiliate networks, free content providers, website creation resources and many other very useful websites and links to help you on your way. Check on the updates regularly! Good luck - and have fun! Have you discovered eBay yet? If not, read Max Barclay's article in the advice section entitled "I Was An eBay Virgin!". It details the process involved in setting yourself up as an eBay user, including instructions on accepting payment by credit card with PayPal! If you have your own stock, eBay UK makes it possible for you to open your own online store. There is currently no charge for opening or maintaining an eBay UK Shop, apart from the standard fees charged for listing and selling an item. There are some excellent books out there offering tried and tested advice about making, saving and investing money both online and offline. 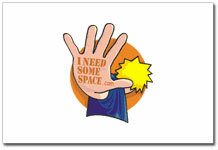 Send an I NEED SOME SPACE Card! If you want to send your bank manager a subtle message, make sure they get the hint with our unique I NEED SOME SPACE postcards (pack of eight)! Order yours now!